3. Mix Flour, baking powder, salt, pepper and cumin seeds. 4. Mash them well and make the dough by adding milk little by little. 5. Now flatten the dough upto ½ inch thick sheet. 6. After that cut the small biscuits with cookie cutter. 7. Now lay them on greased sheet. 8. Bake them until they turn golden brown in sides or till 20-25 minutes. 9. Serve these crispy cookies with tea or coffee. 10. 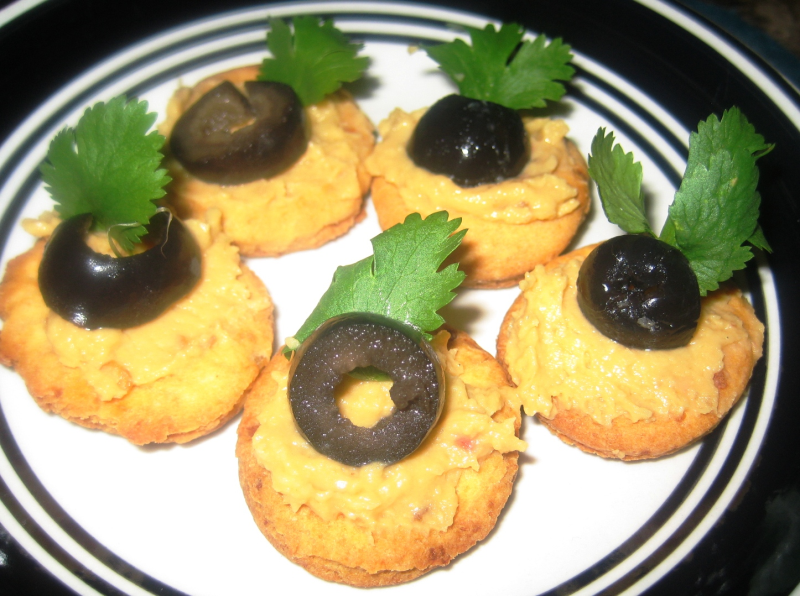 You can also make it as a little snack like spread the hummus on biscuits. 11. Garnish with cilantro leaves and sliced black olives. I don't know what went wrong but they turned out very hard with me, I had to give it to the birds. Thanks Mr Shah and Tina.. Very Innovative keep it up Chitra, thanks for sharing. Hey, these look great, you know what I just saw Sour Cream Dip recipe of Soujanya Hariprasad and I think it will work very good with this. I am sure these biscuits will rock, I will try them asap.